Antonio Vivaldi wrote hundreds of largely famous instrumental works, and his glorious church music is well known; but it wasn't until recent decades that his operas - of which he is said to have created more than fifty - were resurrected. 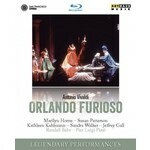 Orlando furioso occupies a central and very significant place among Vivaldi's works. Not only does the whole score of this opera demonstrate its composer's full, creative maturity, but its outstanding features are also an extraordinary musical beauty, an attractive recitative line and a balance thus created between the various parts of the dramatic and musical whole. This exceptional musical achievement was no doubt partly due to the famous theme of the original story, as well as the literary and dramatic qualities of a first-rate libretto. Pier Luigi Pizzi's 1979 production of Orlando furioso in Verona marked the beginning of contemporary international interest in Antonio Vivaldi's operas. Ten years later the same director once more produced this work at the San Francisco Opera, where it was a great success.